Corolla meets Legacy IMO. Not very pretty. wtf, if that comes out, i'll be soooooooooooooooooo ashamed. 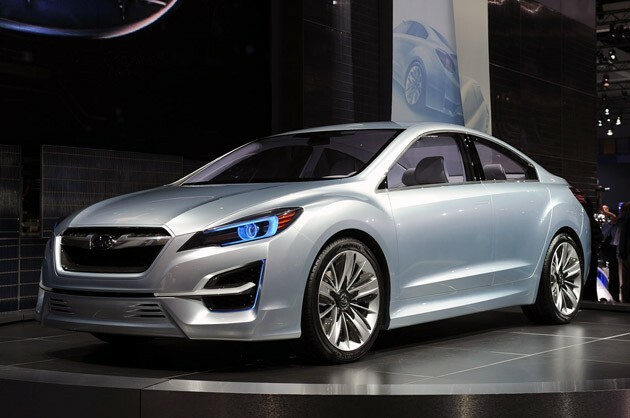 Dont worry guys, Im sure no matter what they finally settle on, its going to be just as ugly as every other Impreza they've put out for the last ten years. In response to this thread https://www.i-club.com/forums/bay-area-15/new-pics-possible-next-gen-impreza-leaked-pic-225486/ and its leaked artist concept rendering. Last edited by Krinkov; 11-17-2010 at 05:15 PM. Krinkov your icon cracks me up man. I find your lack of hood scoop...disturbing. Mos def on this part! Bugeye FTW! Truth. But this concept surprisingly doesn't look lowered at all. Look at all that clearance in the wheel wells. For once, the first impreza since the GC that I've liked upon first sight! Same with every model since... This is the first one with a ton of potential with the aftermarket world. You shouldn't focus on small things like a grill or whatever, that can all be changed, you should focus on the shape of the car, it's lines and how it flows. I love the lights a lot. BTW, I LOOOOOOOOOOOOOVE the rear end! So much better than the previous years (after GD). Thank you Subaru for making it good this time. Now lets hope for some GREAT colors! I dunno I actually really like it! Besides the wheels of course, overall looks pretty cool. I would assume its gonna pack a lot of power with it too! H6 Twin turbo maybe....yeah right. But I'm assuming more displacement for sure. It does to me, but I look at the hub height versus the side-skirt height. This has been getting deeper every year. Look at an older car and you will see that the hub is well below the bottom of the car, or the rocker panel. Each year that passes the wheels get shoved further into the body, regardless of the size of the gap. I find this interesting.